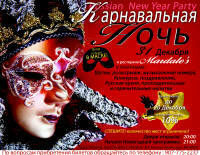 A Russian-Style New Year Celebration! Join us as we ring in a Russian-style new year! 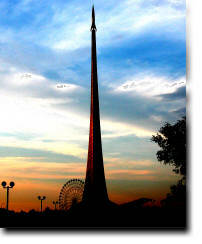 In Russia, on New Year's Eve, people gather with their family and friends to see off the old year and welcome the new. They take the time to remember happy moments from the old year and to joyfully welcome the new with love, hope and happiness. 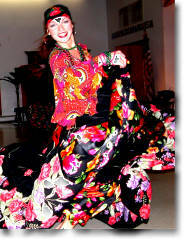 The atmosphere is always friendly and filled with jokes, laughter, eating, drinking, singing and dancing! This is spirit of our celebration! We have both well known and brand new local actors, singers and musicians to perform for you - Leonid Grinberg, Galina Tomisser, Natalia Gerard, Margarita Merkusheva among others. We have New Year surprises, competitions, and dances awaiting you. We look forward to seeing you and your friends at Carnival Night! 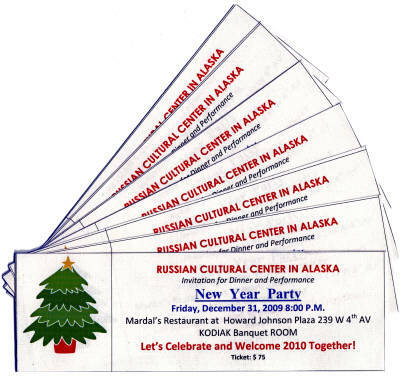 Carnival Night will take place on December 31, 2009 at 8 P.M. in the Kodiak banquet hall of Mardale's restaurant at the Howard Johnson Plaza Hotel on 239 W 4th Ave.
Tickets can be purchased by telephone (907) 775-2237 or from the shop "Style of Russia" on the first floor of 5th Avenue Mall, or from the website www.rusa.alaska.com. Tickets are $75 per person. Hurry and book as tickets are limited! - 2 glasses of wine. A cash bar will be available for additional drinks. Dress to impress. Carnival costumes optional. Masks compulsory. Здесь продаются билеты на Русскую Новогоднюю Ёлку и Карнавальную Ночь в ресторане Мардейлс, Анкоридж. Адрес: 239 W 4 Avenue, Anchorage ( карта ). Начало вечера в 20:00 - 31 декабря. Справки по тел. 907-775-2237, Анна, или vernaya7@mail.ru . Смотреть постер.